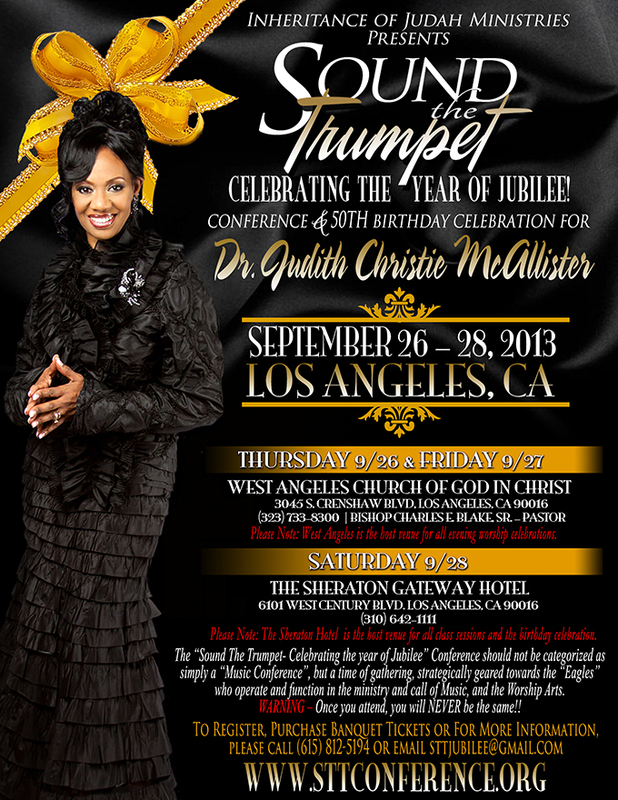 SOUND THE TRUMPET – Celebrating the Year Of Jubilee Conference – Church Of God In Christ, Inc.
Join the “First Lady of Praise and Worship” for three days of spiritual empowerment and enlightenment in HIS presence, September 26th -28th in Los Angeles, California. Conference highlights include anointed worship celebrations, power-packed seminar sessions, and the 50th Birthday Celebration for Dr. McAllister. Special guests include Pastor Tamara Bennett and Dr. John E. Guns. The“Sound The Trumpet- Celebrating the Year of Jubilee” Conference should not be categorized as simply a “Music Conference”, but a time of gathering, strategically geared towards the “Eagles” who operate and function in the ministry and call of Music, and the Worship Arts. 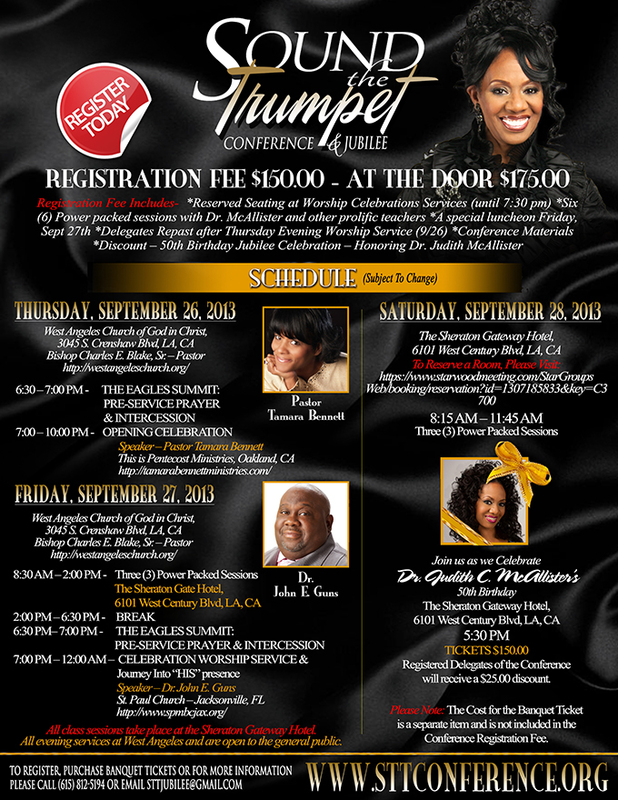 To register, purchase banquet tickets or for more information, please visit www.sttconference.org. You may also call (615) 812-5194 or email [email protected]. WARNING – Once you attend, you will NEVER be the same!! Please Note: For those of you desiring to commemorate Dr. McAllister’s Jubilee Birthday Celebration with a congratulatory ad, that form has been attached for your convenience. Be mindful that the deadline is FRIDAY, SEPTEMBER 13TH. For questions or concerns about ads, please reach out to Evangelist Markita Knight at [email protected]. PreviousPrevious post:A WORD OF THANKS FROM OUR INTERNATIONAL MINISTER OF MUSICNextNext post:IMD WELCOMES ORIGINAL COMPOSITIONS::: ACT NOW!!! !